Let me just start off by saying WE LOVE CHEESE. I mean if we could have it on everything we would. Cheddar, Swiss, Gouda, Gruyere, Provolone, Mozzarella, Just Cheese, Cheese, Cheese! And if you are anything like us you would loathe this recipe. It’s super packed with cheese, bacon, nuts and herbs. YUM! It’s so good and easy to make & just in time to be a feature at your Super Bowl party. Whip it up today & watch the crowd go wild. Behold The Power Of Cheese! Place cream cheese in mixer bowl. Attach bowl and flat beater to mixer. Turn to Speed Two and mix 1 minute. Stop and scrape bowl. Turn to Speed Two and gradually add milk, mixing until well blended about 1 minute. Stop and scrape bowl. Add cheeses, onions, pimientos, half of the bacon and half the pecans. Turn to Speed 4 and beat until well blended, about another minute. Season with salt and pepper to taste. Transfer mixture to a large piece of plastic wrap. Form into a ball and wrap tightly. Refrigerate (or freeze) at least 2 hours. Combine the remaining bacon and remaining pecans, parsley and poppy seeds in a pie plate. Then, remove the plastic wrap and roll the cheese ball lightly in the bacon/nut mixture until evenly coated. Wrap it back up in plastic wrap and refrigerate again until ready to use. 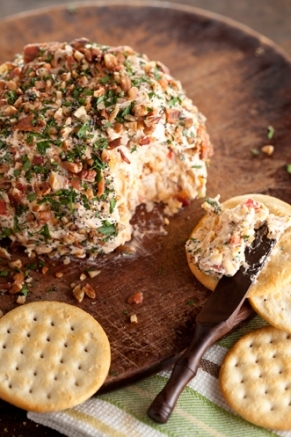 Posted on January 24, 2013, in Lady Fab Cooks and tagged appetizer, food, nutty bacon cheese ball, party food, recipe, snack, the porter house grille. Bookmark the permalink. 3 Comments.